Screening in the London International Animation Festival 2012 | Mair Perkins Ltd.
What an exciting email to wake up to! The collaborative animation project we worked on in January with Leicester based FD2D magazine has been accepted into theLondon International Animation Festival (LIAF) We’re very excited and proud to have work screened at the LIAF. It will be shown at the Barbican, London on the 1st November at 6.30pm. If you fancy coming along to watch, you can book tickets on the Barbican’s website. From Dusk 2 Dawn magazine presents an animated interview with Bill Bailey. A phone conversation between Bill Bailey and Dan Lamoon was recorded and obsessively listened to by a team of creatives in the midlands. The product of this obsession is a surreal and somewhat chaotic visual accompaniment to the interview. Bill’s words have inspired a magical journey to the moon with hummus, an exploration of ectoplasmic cosmic whimsy, a celebrity train ride and a mosh pit with Jon Snow. Dan Lamoon recorded a phone interview with Bill Bailey then approached local animators, illustrators and a music producer to create an animation to the phone interview. It was a real team effort with a fast turnaround. Everyone worked remotely in different locations across the midlands and utilised the technology of Facebook, Dropbox, You Tube and Wetransfer to communicate and work together. 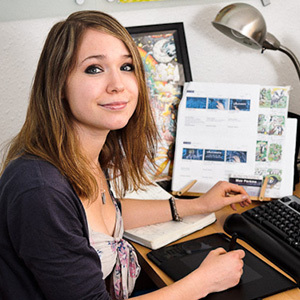 Mair Perkins helped in the direction, project management, animation and illustration of the film as part of a team of creative professionals based in the midlands.